This blog is the first in a series highlighting The Library Project’s book content in relation to various topics. 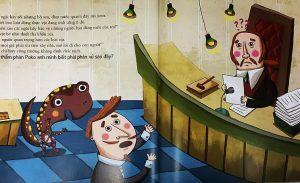 Today, we’re highlighting one of our newest additions to the bookshelves of The Library Project Vietnam. 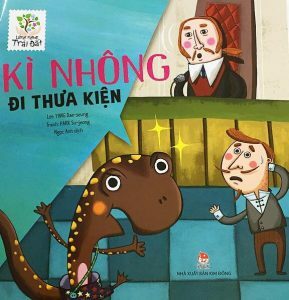 Kì Nhông đi thưa kiện, which translates roughly to The Salamander Sues the Human, walks readers through a court case centering around the protection of the wetlands. Judge Poko is surprised to find that his newest case is brought about by an animal. He takes on the case anyways, which has Mr. Salamander arguing against the Chief of Construction. The human wants to destroy the wetlands, the home of Mr. Salamander, in order to build a road and new houses for the city’s growing population. Mr. Salamander shows the beauty of his home in the wetlands and begs the importance of each animal living there. He explains that some of the animals even help purify the water which is helpful for humans. He explains that the location of the wetlands allows it to act as natural storage: an easy place for humans to get water during dry season, and a place for floodwaters to drain to during rainy seasons so that homes are not destroyed. The Chief of Construction claims that with a growing population they must build out the road in order to make more room for people. He argues humans are more important and we should make decisions that create comfortable and convenient lives for humans. Mr. Salamander, however, asks Judge Poko to protect the environment instead, remembering its important role in human lives, also. So how does it end? With a big question mark over Judge Poko’s head! 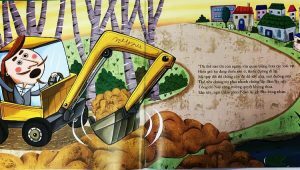 Personally, I love this book because it meets children where they are. Sometimes, life is black and white, wrong and right, but often we find ourselves living in the grey areas. Children deserve opportunities to know what that grey space is like, what it is like to see multiple angles to a problem and to reason through the details. Whatever conclusion they come to in the end of this book will be the “right” one, because they spent time thinking critically through it and came up with a solution on their own. That is why we, at The Library Project, believe in the power of books and the importance of giving children access to them. The Library Project has been focusing on rejuvenating its bookshelves by including educational books focusing on specific topics such as science, health, kindness, gender equality, bravery and the environment. With a rising temperature of the climate, melting ice caps, dying oceans and pollution that’s destroying much of the Earth, it’s no surprise why we’re including the environment in our libraries. Vietnam, a country whose coastline spans over 1,000 miles from north to south, has multiple ecosystems. 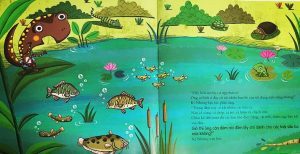 From wetlands, forests, tropical jungles and marine ecosystems, the diversity provides an abundance of plants and animals, many of which are native to, and only found in, Vietnam. Like most other countries in the world, Vietnam faces its own environmental challenges. Being a developing country only adds another taxing layer to this. Vietnam faces air pollution, chemical pollutions and water pollution. This is a country with deltas which provide farmers with the perfect soil for farming, yet rising sea levels and polluted rivers negatively impact the lives of those in rural Vietnam. By including books like Salamander Sues the Human, we can bring to light the challenges that many of these students are actually living. They are the future of Vietnam, and growing up with environmental awareness and critical thinking can help them become the leaders the world needs. 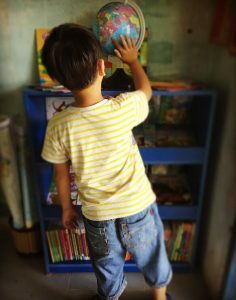 Learn more about The Library Project and our work in giving children access to quality resources here.